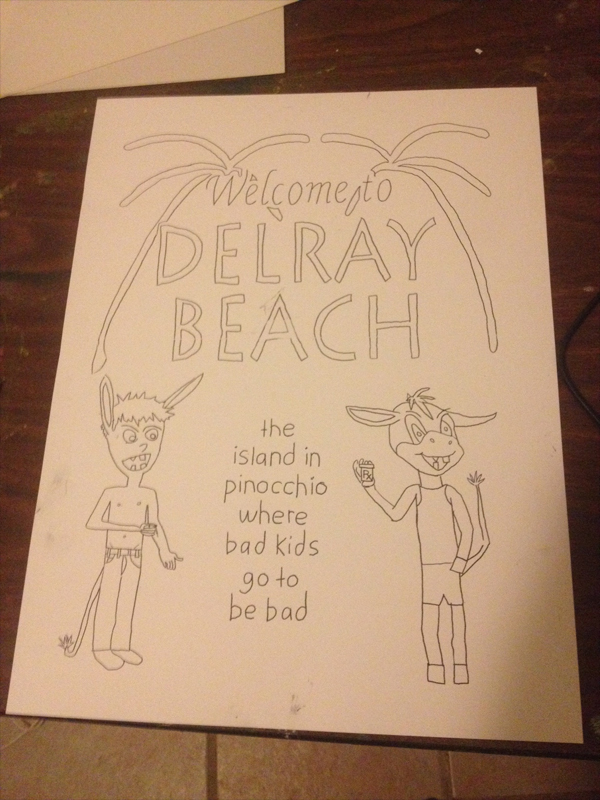 “Greetings From Delray Beach.” 10/8/13. Pencil, marker, digital. 10×13½”. I started offering t-shirts with my artwork on them recently. 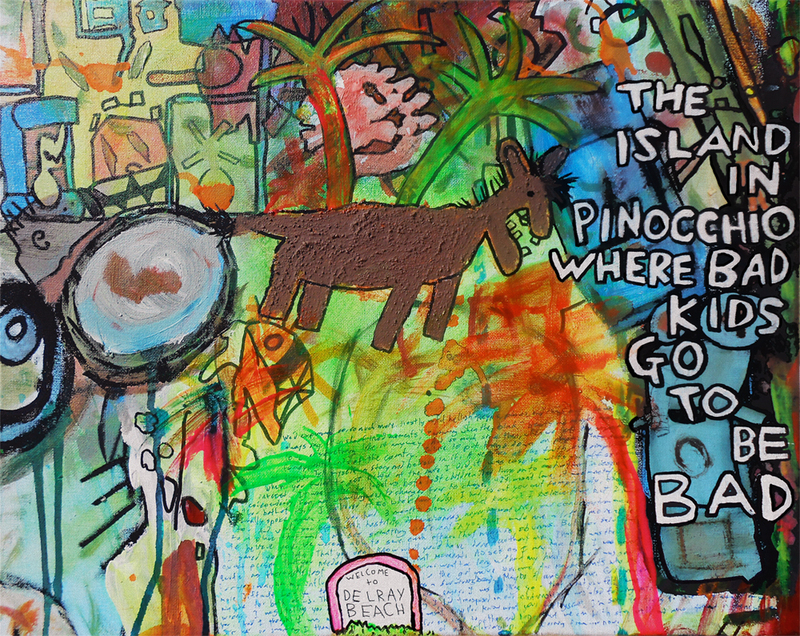 Originally, the plan was just to offer shirts featuring my simpler cartoons, but I decided that there was no reason not to open it up to include my paintings as well. Since some of my more expressive paintings though can’t exactly be transferred to a shirt, the plan was that if someone wanted to buy a shirt like that, I would “adapt” the piece for the shirt (just as I had with “Merry Christmas 2K12”). I wasn’t 100% certain she was even talking about the shirt, but I was immediately excited. I love that painting and the story behind it but – as soon as I saw her comment – I realized that its caption could also be the basis for a really cool cartoon. I finished sketching out the cartoon “adaptation” late last night. As soon as I woke up, I inked and colored it. At that point though, I was suddenly not so excited. The problem was that I had wanted it to be as big as possible (for the sake of the t-shirt) but now – looking at it – it felt like two separate imaged stacked on top of one another. But – after scanning it into the computer and playing with the layout – I’m really happy with the finished product. Thanks, Ren! Aside: I feel a little funny about there being so many “products” related to this piece but it’s not like I’m not making the stuff that I want to make. My life costs between six and eight thousand dollars per year. I’m pretty excited that I haven’t had to get a regular job in order to pay for it yet. 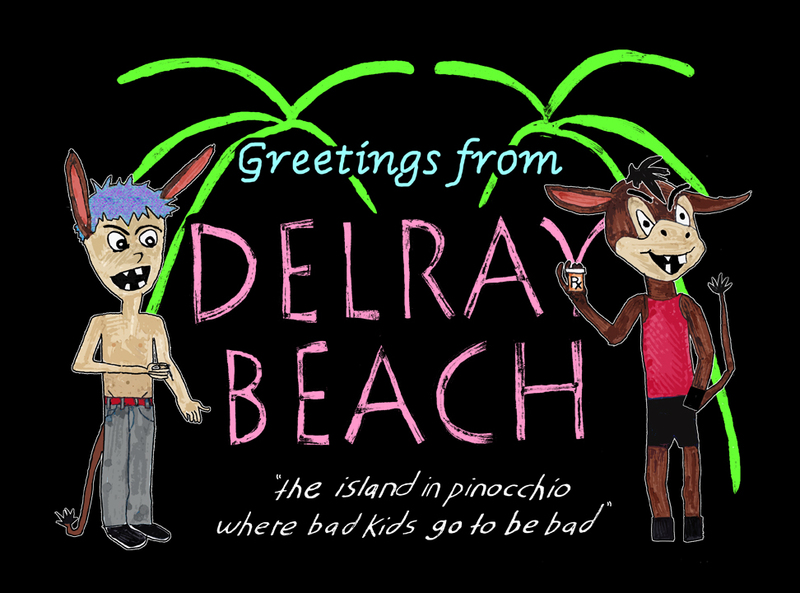 Update (same day): “Welcome to Delray Beach” is now “Greetings from Delray Beach.” Makes more sense to change it for this piece.